This is a Power Point describing some of the new laws as regards domestic and sexual violence that will become effective in Virginia as of 7/1/12. This is an assessment tool to evaluate the policy and practice for effective process and enforcement of protective orders in a particular jurisdiction. It is intended to be utilized by Coordinated Community Response Teams (CCRTs) to assess their local community response. Initially developed in 2008, the Tool has been revised to facilitate an assessment of your community’s efforts to improve the cultural responsiveness of services in your community—the ability to adapt services to meet the diverse needs of victims regardless of age, race/ethnicity, or other cultural identity. While the Tool was designed to address services around protective orders, it may also be helpful in fostering discussion in your community around other services for victims of sexual and domestic violence. Recent changes to immigration enforcement have resulted in social services agencies across Virginia reporting decreased numbers of immigrant families requesting access to services. Some immigrant families even seek to withdraw their U.S.-born children from crucial benefits for which they are eligible due to fear of immigration enforcement. 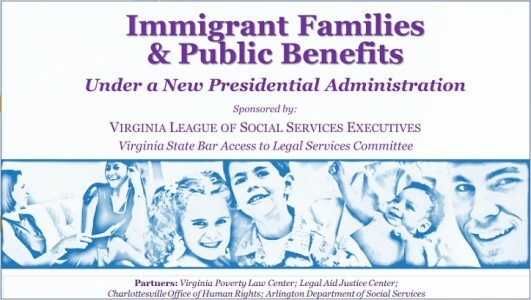 This PDF document is from a webinar given on March 31, 2017, to discuss changes in the immigration enforcement landscape, its impact on immigrant communities, immigrants' eligibility for public benefits for themselves and their U.S.-born children and strategies to encourage immigrant families to continue to access public benefits for which they are eligible. The webinar was sponsored by the Virginia League of Social Services Executives, Legal Aid Justice Center, Virginia Poverty Law Center and the Virginia State Bar Access to Justice Committee. 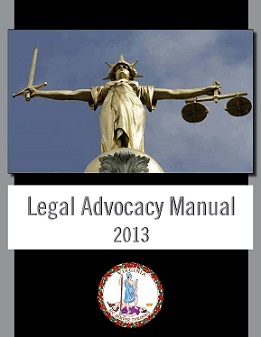 The Legal Advocacy Manual provides victim advocates (as well as victims) with a comprehensive guide to help domestic and sexual violence victims in Virginia through some of the legal processes in which they may become involved. It provides both basic and intermediate levels of information about legal advocacy--what it is, the difference between civil and criminal justice systems, definitions of commonly used legal terms, and how to avoid the unauthorized practice of law, among other topics. The manual offers context for the emotional, logistical, and legal hurdles involved in protective orders, criminal prosecutions, visa applications, and divorces. It is 76 pages long and is in PDF form. Susheela Varky of Virginia Poverty Law Center updated it in June 2013 for recent changes in the law. Ms. Varky has used the manual as a resource for in-person trainings geared to victim advocates, and is available to tailor such trainings for your local Virginia domestic or sexual violence program.